FHI 360 (formerly AED) has been leveraging the private sector to improve child health and well-being all over the world for decades. We have continued to implement state-of-the-art child survival programs built on synergistic partnerships across the public and private sectors. The N-MARC Project—with the Ministry of Health, four Nepali zinc manufacturers, and a national NGA—designed and executed a campaign to promote the combined use of oral rehydration salts (ORS) and zinc for the treatment of diarrhea in children under the age of five. The broadly implemented campaign led to higher awareness of the benefits of zinc among health providers and caregivers, increased demand for the product through both the public and private sectors, and improved compliance with the recommended ten-day zinc treatment regimen. The POUZN Project in India, Tanzania, and Indonesia aimed to grow both the supply and demand sides of the pediatric zinc market. On the supply side, AED supported efforts by the pharmaceutical industry to produce zinc for the public sector, while developing branded zinc products for sale in the private sector. In some cases, the project provided matching funds to partially offset the risk for for-profit businesses of launching a brand new consumer product in an untested market. To boost demand, AED worked extensively with the public and private health provider communities to change diarrhea-related prescribing practices, and implemented public education campaigns to promote the use of zinc and ORT by caregivers. Following intense advocacy efforts by AED and the Pediatric Society of Indonesia, the Indonesian government included zinc treatment for diarrhea in its Integrated Management of Childhood Illness (IMCI) guidelines. AED's advocacy efforts also resulted in the Indonesian National Agency of Drug and Food Control allowing zinc product registration to be fast tracked. In Tanzania, AED helped ensure the addition of zinc to the Ministry of Health and Social Welfare's list of essential drugs, and secured its inclusion into IMCI guidelines. These actions resulted in the subsequent procurement of zinc treatment by the public sector for all public hospitals and health posts. 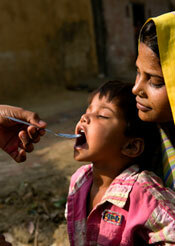 In India, AED advocated for the inclusion of diarrhea treatment in national policy guidelines, and worked with the government, the Indian Academy of Pediatrics, UNICEF, and local NGOs to ensure public-sector provision of zinc.